WebGallery will simply and effectively create galleries of images suitable for placing on websites. WebGallery has been under development for a little while, being initially developed as an internal tool for my own websites, to aid the creation of photo galleries and to provide an easy and effective way of recreating web tables if an extra photo is inserted or moved. It's possibly one of the most complex applications I've written and is the culmination of several years ideas and individual utilities being incorporated into a single, comprehensive application. WebGallery has a number of powerful features and is designed to be as flexible as possible, allowing many hundreds of permutations of effects and choices. As usual with a lot of my shareware, ease of use and range of options is extensive and as such I'm hoping this will become the definitive tool for creating online photo galleries from directories of source images. Its flexibility is unrivalled and most things can be customisable, not only via the front-end configuration settings but also via a powerful web template system (examples provided). 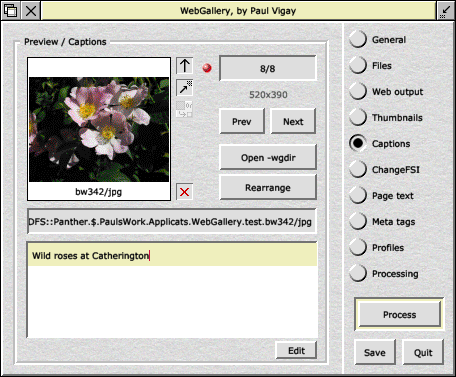 WebGallery has many features not seen in other web creation software and as such, represents one of the most powerful and flexible online gallery creation packages currently available for RISC OS. To see examples of some of the galleries produced using !WebGallery, please visit the links shown below. Effects can be combined to form 1000s of permutations. Can cope with deeply nested source and destination directories for ChangeFSI conversions. Create entire web galleries, or just a table of thumbnails for inserting into your own pages. Unlimited output size for images, with large selection of preset sizes for convenience. Powerful web template system allows for unlimited flexibility. User expandable library of background images and navigation icons. Ability to add captions to images. Ability to drag and drop images to reposition the order. Range of ChangeFSI options can be edited by the user. Add or Edit custom navigation labels and page titles/copyright messages. Add or Edit meta tags such as keywords or description. Multiple profiles for storing complete sets of choices for different web sites. Comprehensive printed user manual for registered users. When you first download the application, it will run in a slightly restricted 'demo' version. By registering the application you will be provided with a registration code which will remove all restrictions imposed in the demo. You will also be eligible for free updates in the future. Registered users also receive a comprehensive printed manual for WebGallery. In the Thumbnails panel, you can only have a maximum of 3 thumbnails per row and 3 rows per page. The registered version allows up to 20 thumbnails per row and 100 rows per page. The web templating system is unavailable. You can only use the default WebGallery design controls. Although you can define your own profiles, the active one is reset to 'Default' when you load WebGallery. Registered versions reload the previously active profile next time you load WebGallery. WebGallery forms part of my growing range of tools for making web design easier. The internet is one area where lots of users are interested in at the moment, and I'm always developing tools to make life easier for web designers, such as utilities for automating time consuming tasks. Users of WebGallery might also be interested in WebAnim8r for creating animated graphics for web and presentation, or Webworkz for converting Fireworkz spreadsheet files into HTML pages. If you have any ideas for future applications please contact me as I'm always looking for interesting utilities to write. The following sites use WebGallery for their photo/image presentations. If you're using WebGallery on your own website and would like me to link to it from here, please contact me. They all utilise the web templating system within WebGallery, unless otherwise stated. Horndean Wildlife - My dad's wildlife and conservation website. Paul's Digital Photo Gallery - My own online photo album. Mark Young Movie Stills - Celebrity and portrait photographer. Fiona Lake Photography - Fine Art Photography. You can add and edit your own captions to each image in your gallery. The first line of each caption will be displayed on the thumbnail index page, whereas the full caption (up to four lines) will be added to the individual image pages. By clicking on the Rearrange button you can re-position the order in which your images appear in the gallery (see below) so that a great deal of flexibility is possible. A small warning LED will change to red if other options set within WebGallery is likely to affect the actual output of captions in the final product - flexible controls allow you to replace captions with image filename/number or have no captions added (even though you can still edit them for possible future addition). 'Drag and Drop' re-arrangement of images. By default images are displayed in the order they appear in the filer display (alphabetical). However, this may not always be the desired order you wish to display images in the final gallery. A simple 'drag and drop' interface exists so that you can drag small thumbnails around in order to move their positions. If you drag an image, it will swap with the image in the position you 'drop' it. Alternatively, you can hold SHIFT down and drag an image. It will then get inserted in the position you drop it and all inbetween images will be shifted backwards or forwards, which makes rapid repositioning of images possible. By enabling the 'Convert images only. 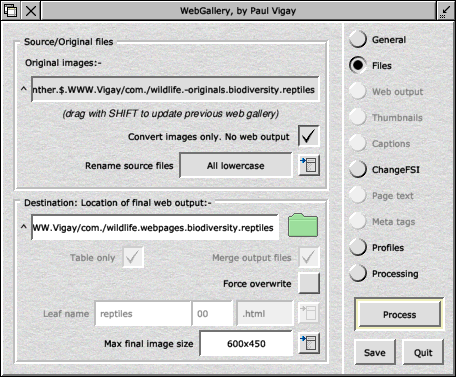 No web output' option in the Files panel, WebGallery will disable irrelevant panels for simplicity and act as a simple batch converter for ChangeFSI. Simply drag a directory of source images, a directory for the destination images, set the final image size and the ChangeFSI options you require, then leave WebGallery to do all the conversions. Advantages are automatic coping of landscape/portrait sizes of images and allowing long pathnames for source and destination directories (unlike some batch converter utilities). There are a number of known limitations, which will be listed here. These are not bugs but moreover design limitations. All source images have to be in the same directory. WebGallery is not a multi-purpose photo indexer, but rather a utility for web design. Thus if you're sourcing images from all over the place, you should copy them into a specific directory before using WebGallery. When rearranging images, memory is temporarily claimed from the system sprite area. If you don't have enough memory in the machine, this can potentially generate an error. Rearranging images can also take quite a very long time, depending upon the speed of your computer. When converting images stored on remote filing systems or USB pen drives, processing can be *very* slow. Please bear this in mind, or better, copy files to a local hard drive before processing. WebGallery is a very complex application which allows possibly 1000s of different permutations of options, depending upon which things you've turned on or off. Although it's designed to be simple and take the pain out of creating web sites manually, it's always possible that it may get confused and create unexpected output. If this happens, please try to remember the exact sequence of events that you did prior to it going wrong. Again, please report any files being left open. Nothing at the moment. Please feel free to offer suggestions though. 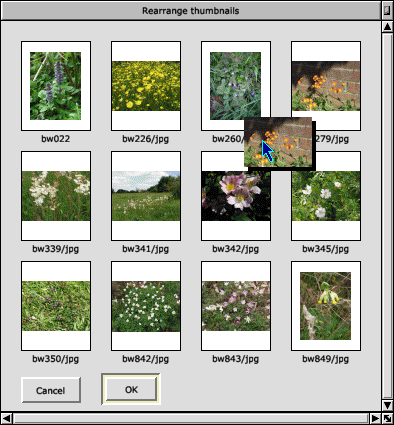 An application for automating the process of making a thumbnail index for a set of JPEGs which could be used on websites or CD Roms to store and index photographic images. A similar application for generating galleries from directories of indexes, but with slightly fewer configuration options. Click here to view a detailed history of WebGallery versions.